Chronic Wasting Disease (CWD) is a contagious neurological disease affecting deer, elk and moose that has no cure and is always fatal. It was discovered in Missouri in 2010. Since then, the Missouri Department of Conservation (MDC) has taken measures to stop or slow the spread. Their efforts are working. Now, MDC’s authority to regulate Chronic Wasting Disease is under attack by legislation aimed at transferring control of captive deer from the Missouri Department of Conservation to the Missouri Department of Agriculture. Even though, the Department of Agriculture has publicly testified they do no want the transfer of control to take place. CWD was first recognized in 1967 in captive mule deer in Colorado. Since then, CWD has been found in Missouri and 21 other states and several Canadian provinces. These include Colorado, Illinois, Iowa, Kansas, Maryland, Michigan, Minnesota, Montana Nebraska, New Mexico, New York, North Dakota, Oklahoma, Pennsylvania, South Dakota, Texas, Utah, Virginia, West Virginia, Wisconsin, Wyoming, and Alberta and Saskatchewan. CWD is believed to be spread by shipping live infected animals across state lines to high-fenced enclosures for breeding and shooting. It is imperative that Missouri close its borders to the importation of live deer. 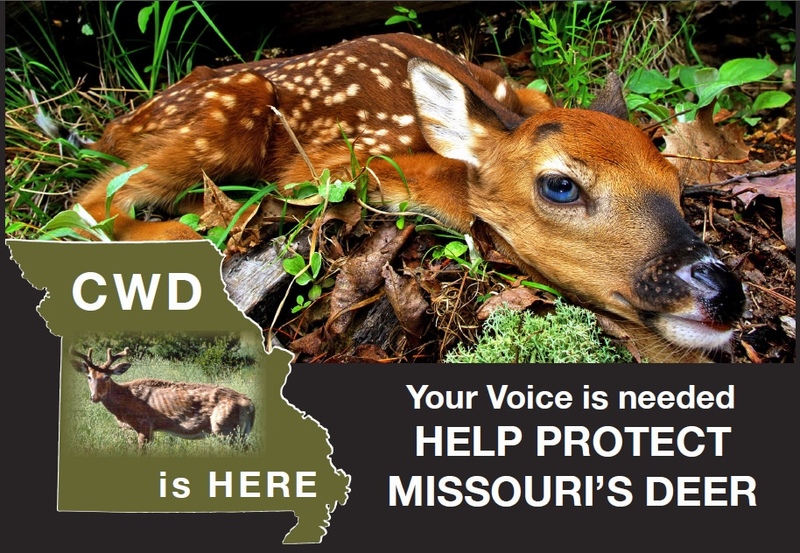 Doing so will greatly reduce the threat of further contamination of Missouri’s wild deer herd. CWD is spread both directly from deer to deer and indirectly to deer from infected soil and other surfaces. Animals with signs of CWD show changes in natural behavior and can exhibit extreme weight loss, excessive salivation, stumbling, and tremors. CWD in deer can only be confirmed by laboratory tests of brain stem or lymph tissue from dead animals. Once well established in an area, CWD has proven to be impossible to eradicate. States with CWD must focus on limiting the spread of the disease and preventing its introduction to new areas. Infectious diseases such as chronic wasting disease (CWD) threaten Missouri deer, Missouri’s nearly 520,000 deer hunters, millions of wildlife watchers, thousands of landowners, 12,000 Missouri jobs, and hundreds of businesses and communities that depend on the $1 billion boost in economic activity related to deer hunting and watching. Missouri’s first cases of CWD were detected in 2010 and 2011 in captive deer at private big-game hunting preserves in Linn and Macon counties. A total of 11 cases of CWD have been confirmed in captive deer at these facilities. CWD has since been found in 10 free-ranging deer within two miles of the captive facility in Macon County. In Missouri, CWD has not been detected outside of a small area that borders northeastern Linn and northwestern Macon counties. Missouri offers some of the best deer hunting in the country, and deer hunting is an important part of many Missourians’ lives and family traditions. Infectious diseases such as CWD could reduce hunting and wildlife-watching opportunities for Missouri’s nearly 520,000 deer hunters and almost two million wildlife watchers. Deer hunting is an important economic driver in Missouri and gives a $1 billion annual boost to state and local economies. Lower deer numbers from infectious diseases such as CWD could hurt 12,000 Missouri jobs and many businesses that rely on deer hunting as a significant source of revenue, such as meat processors, taxidermists, hotels, restaurants, sporting goods stores, and others. CWD also threatens the investments of thousands of private landowners who manage their land for deer and deer hunting, and who rely on deer and deer hunting to maintain property values. If CWD spreads far and wide in Missouri, deer hunting as we know it will cease to exist, and rural Missouri economies will lose the significant financial benefit hunters bring to their cities and towns.